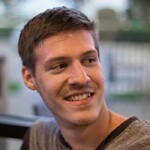 Caleb Davis is a video production manager and coordinator. Caleb also consistently takes on production projects emphasizing in cinematography and editing with his production company. Caleb has been fascinated with cinema since a young age, remembering times when his dad would sit him down to watch Hitchcock marathons on television. Through this experience and many others, Caleb has furthered his education of film through the study of cinematography and a growing passion for editing and production design. Caleb spends much of his time reading and analyzing film and television, and enjoys collaborating with passionate people who love to bring ideas to life. If you don't see Caleb at the theater, he's probably off enjoying a round of golf or exploring different places to find a great snack.